28 bore swamped re-browned octagonal barrels with gold oval signed Jover & Son, London. London proof marks and stamp of William Jover. 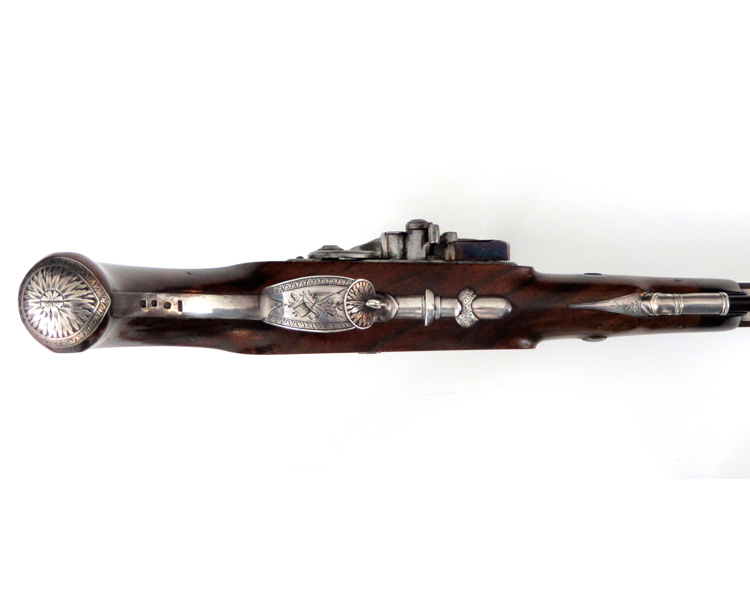 Finely figured walnut half stocks. 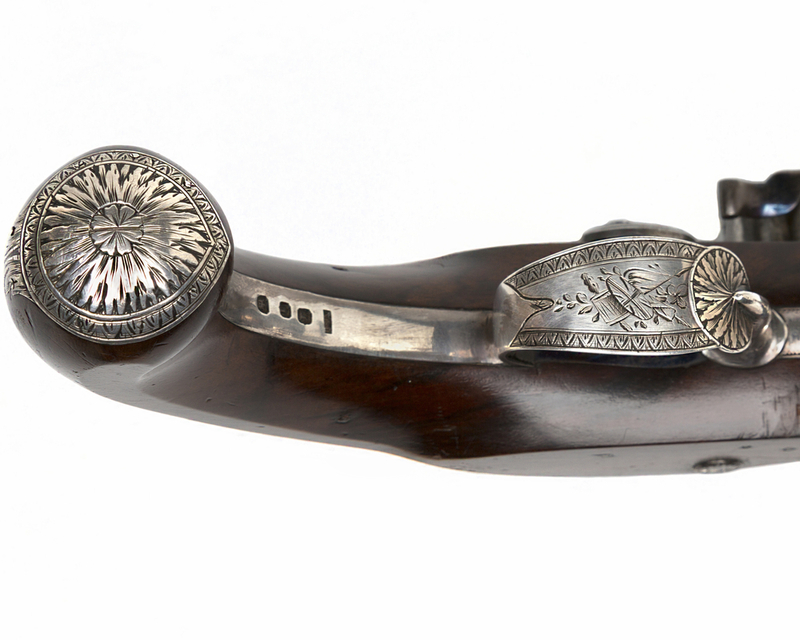 Silver mounts are stamped with makers mark of Michael Barnett and date lettered for 1784. Oval escutcheon with the Scottish family crest of "Hannay". Full silver ribs under the barrels, original baleen ramrods, which retain their iron worms. Lockplates with flat face, stepped floral engraved tail and filed beveled edge has a gold oval, engraved "Jover". Priming magazine operated by pushing the cam on end of pan. Vent and pan gold lined. Frizzen springs and trigger plates retain much of their original blue. Cased in a walnut box with some accessories and a later glazed top for viewing these lovely pistols. Provenance: D.S.Lavender Antiques LTD. London. 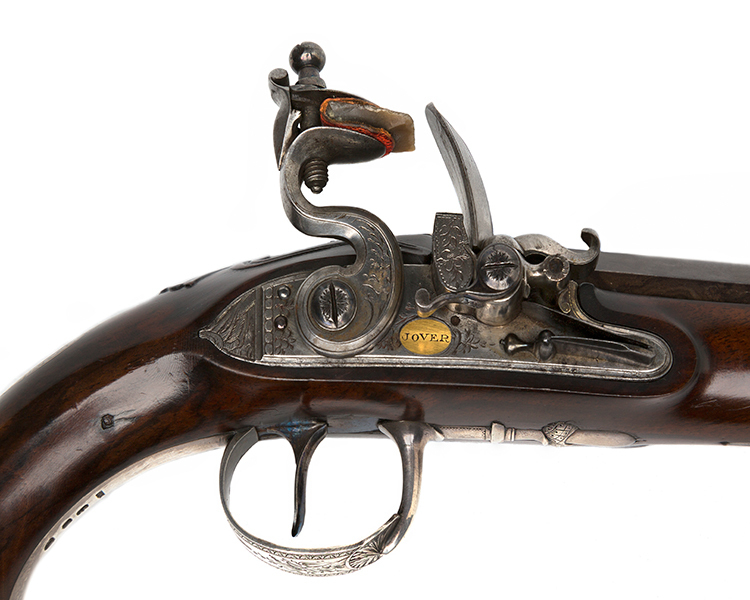 For a pair of pistols with this priming device see: “Early Firearms of Great Britain and Ireland” published by The Metropolitan Museum of Art, 1971. Item #35, page 45.